Welcome to Britta Blvd's temporary home! My longtime webserver crashed hard, sadly becoming a ghost just in time for Halloween season, so it will be a while before BrittaBlvd is up & running properly again. In the meanwhile, you can follow BrittaBlvd on Instagram and Facebook for current updates, and these sections still work! EerieElegance.com has the information & order pages for my three books & other spooky style! 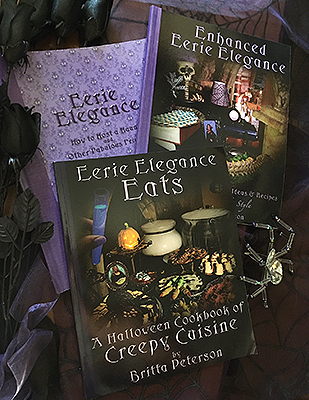 The three Eerie Elegance books, Eerie Elegance, Enhanced Eerie Elegance, and Eerie Elegance Eats, show you how to create your own spooky environments and recipes as shown on Britta Blvd. Not only are Britta's unique Halloween recipes included, but she reveals how she creates her decorations and displays with step-by-step instructions and full-color photos that show you how to transform your own home into a Halloween haunt. Ideas range from the simple and budget-conscious to elaborate environments and everything in between, so there is something for everyone from Eerie Elegance! All three books are on sale on Amazon, as well as autographed copies directly from the author on EerieElegance.com...order now! My Britta Blvd Etsy shop has accessories for wizard parties, Halloween parties & other fun!